“The return of good times is not wholly a matter of money. There is a prosperity of living which is quite as important as prosperity of the pocketbook. It is not enough to be willing to make the best of things as they are. Resignation will get us nowhere. We must build what amounts to a new country.”—Ladies’ Home Journal 1932. I’m not a life coach but I do offer spiritual mentoring and prosperity consciousness mentoring—which means helping you sort out what is amiss in your life whether it’s spiritual, emotional or financial. Have I been where you are? I don’t know. But I do know that I’ve been lost, lonely, broken, in debt, in pain and seriously ill. And now I have sparkle in my eyes and I am well, successful, prosperous and happy. I believe, from my experience, that poverty consciousness, whether it’s over money, relationships, health or general well-being, originates in the soul and it is always about worth. If we, at some level, don’t believe we are worthy of love, happiness or financial success, then we will not be able to experience them as we might hope to do. A lack of self-worth usually involves a lack of knowledge of our soul’s presence and purpose—and an unhappy or misunderstood relationship with the Divine Consciousness. In a nutshell, if things are going haywire you’ve strayed slightly off-track from believing you have the right to follow the blessed pathway which was meant to bring you success, peace of mind and joy. This pathway is your birthright and it is always available to you. And if you’re off that path, it’s most probably because you started believing what other people thought you should believe rather than what you knew, deep down, to be true. Or maybe a thought or a belief that used to serve you has run its time and it’s hard to let go of it because the ‘tribe’ around you all hold that belief and it’s part of your identity. Very often, we hurt and we become broken because we take too much care of others and too little of ourselves. We forget that Jesus said, ‘Love your neighbour as yourself.’ Not more, not less. And, try as you might, you can’t give from an empty vessel and you’ll crack if you keep trying. I believe that we are given this life in order to be happy and to spread happiness. It is our Divine Duty to seek and find joy in our lives—and when we do, then our finances will improve too. Yes, there are times when it’s almost impossible to be happy—when someone we love dies, for example—but we can still feel an underlying sense of peace of mind and, just as importantly, communicate that comfort to others. And though the pain that we have experienced—and survived—we can inspire others too to get up and try again. Bless you prison. Bless you for being in my life. For there, lying upon the rotting prison straw, I came to realise that the object of life was not prosperity, as we are made to believe, but the maturity of the soul.—Aleksandr Solzhenitsyn. 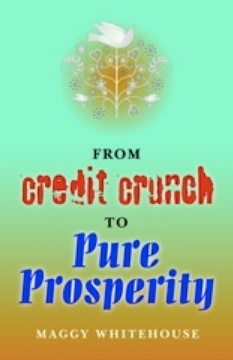 From Credit Crunch to Pure Prosperity, available in paperback and Kindle editions. Sessions are generally via Skype (unless you are close enough to visit) and will take around an hour. You may need one, you may want several. It’s always up to you. Price for a full all-bells-and-whistles practical and effective one-off get-your-life-back-on-course session on spiritual, emotional and financial prosperity: £150. Price for several ongoing sessions (as regular as you want them): £50 per hour.If those are scary amounts, take heart, there is always some help available. The second option would be to buy my book From Credit Crunch to Pure Prosperity which contains all the teachings which helped me turn my life around. If you’d like to know more—absolutely no obligation and no chasing you for business—please email me on maggy@maggywhitehouse.com or find me on my Spirited page on Facebook.